A Thanksgiving tradition is getting a modern upgrade — this year’s Macy’s Thanksgiving Day Parade will be broadcast live in 360 degrees on YouTube, while a new app offers spectators a virtual reality parade experience carved from the event’s vivid 90-year history. The 360 video, broadcast through sponsor Verizon’s YouTube channel, marks the first time that the live footage of the parade is available anywhere outside NBC since the annual event first aired on the network 64 years ago. While viewers can still find the parade on their TVs, YouTube’s 360-friendly format allows the parade to be broadcast from all angles. This year marks the parade’s 90th anniversary, with the lineup expected to include floats representing every decade since the start of the tradition. Verizon will be broadcasting the parade from 360-degree cameras in five different locations along the route. The broadcast will be available on Verizon’s YouTube channel from 360-friendly browsers, as well as mobile devices. Macy’s YouTube channel is also sharing behind-the-scenes peeks at the parade leading up to the event, including a 360 tour of the studio where the parade’s iconic balloons are dreamed up. The series covers everything from the balloons to the float construction. And if the live 360 view isn’t intriguing enough, the department store is also offering glimpses into past parades with a new virtual reality app for both iOS and Android mobile devices. Macy’s Parade Time Traveler can be used with a smartphone’s camera outside Macy’s flagship New York City store to show virtual reality balloons from multiple eras heading down the street. 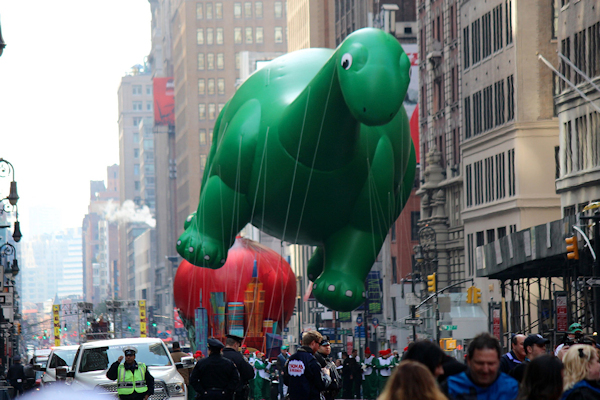 The app also works in local Macy’s stores or from any location to add parade floats to any scene. The app allows users to choose a decade to see a computer-generated VR experience based on the parade’s history, including how the apparel of the crowd has changed. Users can also create a parade from the comfort of their own kitchens (or sofas) — the app introduces those iconic parade balloons in any setting. The parade kicks off at 9 a.m. ET on Thanksgiving Day — Thursday, November 24.